Two Vikings advanced to the West Regional 4A/3A MPSSAA tournament held February 24-25 this year. 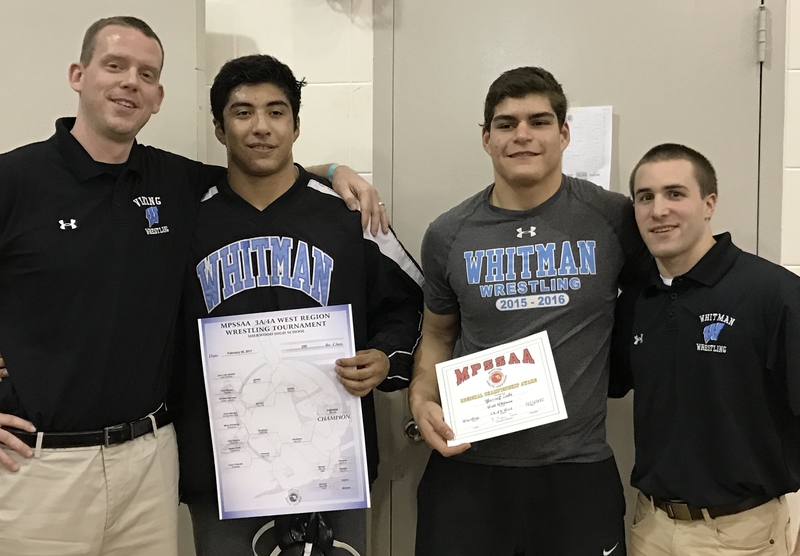 Whitman’s big guys once again made a good showing at the Regionals with both John Luke Iglesias and Yussef Zaki making it onto the podium. John Luke was crowned champion for the second week in a row with his final round victory over senior Damascus wrestler Mikey Bradshaw. His Regional Championship victory gained him one of the four number one seeds at the State Tournament. Yussef also wrestled well in the Regionals and brought home a 3rd place finish, improving his lot by one place from the County Tournament the week before. This qualified him to advance to the State Tournament at Showplace Area in Upper Marlboro, MD. The State 4A/3A Tournament was held on March 3-4 and has entrants from all four Maryland Regions, North, South, East and our own West Region. John Luke went 2-2 at the tournament and made it to the consolation quarter finals, and again beat out Bradshaw of Damascus to get there. Yussef faced some tough opponents but managed to go 1-2 at the tournament. Congratulations to both our “bigs” for great seasons!